Are you an entrepreneur at the helm of a healthcare startup, at the cusp of innovating unique ideas to transform healthcare delivery through your services and products? Are you looking for a platform to showcase your innovative ideas and your startup to the influential stakeholders of healthcare sector? 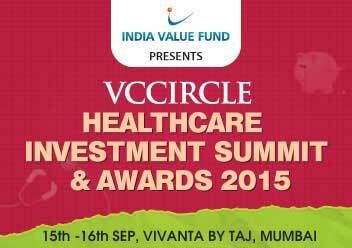 If yes, then VCCircle's Healthcare Summit 2015 is the place for you to be. As evolving trends in healthcare sector offer numerous opportunities, VCCircle is driven by the conviction that innovation and growth of entrepreneurial initiatives can go a long way in providing alternatives to the conventional issues faced by the healthcare as whole. Keeping this conviction in mind, VCCircle will be more than happy to provide budding healthcare entrepreneurs with disruptive and innovative ideas, a platform to showcase their products and services at the VCCircle Healthcare Summit 2015, the one-of-its-kind event in this sector. If you want to seize this opportunity to showcase your start up please write to Prateek/Tuhin at prateek.kathpal@vccircle.com or tuhin.chakraborty@vccircle.com telling us about your company and its unique products/services, funding status, patent pending technologies and team background. We would be happy to consider your entry and after due assessment provide you with opportunity to showcase your startup. To register yourself now, please click here or write to Kanika at register@vccircle.com /0120-4171111.